Any one of these place names might conjour thoughts of remarkable wines, pungent cheeses, or exquisite meals—and rightly so. But in the last few years, Beaune has been luring visitors to linger after their decadent dinners and explore the town with its Animations Nocturnes (Evening Animations). Beaune is a picture of bustling restaurants and modern storefronts tucked into centuries-old buildings strung along the tiny town’s tangles of narrow streets and encircled by substantial remnants of medieval ramparts. And throughout the summer, residents and travelers alike meander through the town to discover whimsical sound and light shows—a different one on each of six historical buildings. In many European towns these days, this kind of creative and colorful display of CGI (Computer Generated Images) married with local history and architecture is engaging its viewers in sensory ways that enhance one’s appreciation and understanding of the town. Countries like France (Lyon, Reims, Blois, Beaune), Belgium (Ghent), Germany (Berlin), England (York), and Finland (Helsinki), now routinely re-purpose building facades as artistic canvases for animated video and photo images that are a must see for any traveler. 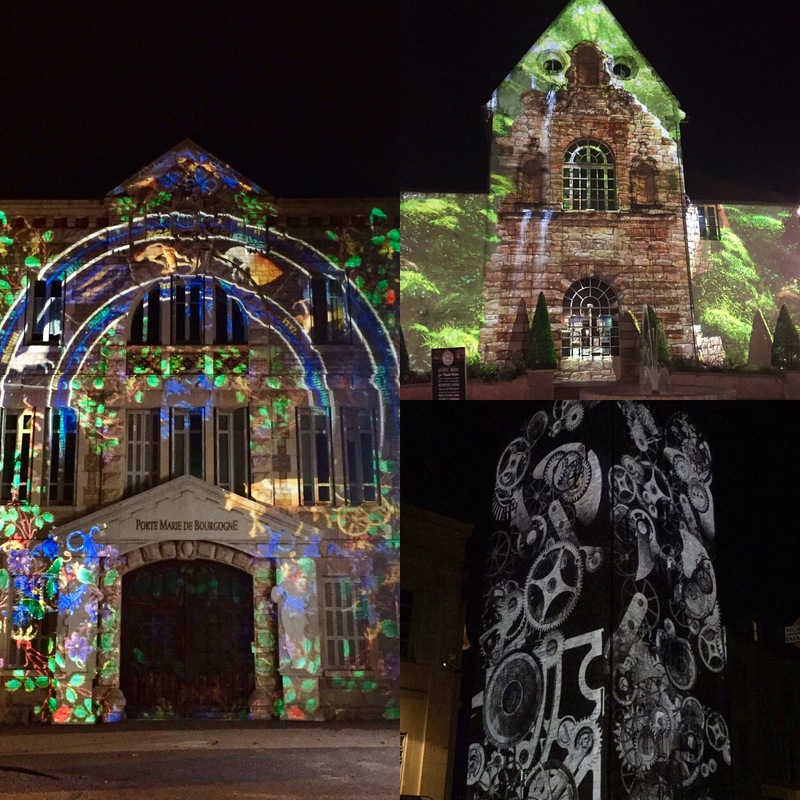 To get an idea of what you might find on your next summer night visit to Beaune, check out this video of some of the Animations Nocturnes. You might find it…illuminating. Previous Post Why Climb Every Mountain When You Can Take the Lift? This video is awesome. I just shared your post on FB. When I first saw the photo I thought it was cool that they were projecting ivy on old buildings – one of the things I already love about Europe (the real stuff that is) but now I see it movessss. How magical is that?! I was in Beaune and Lyon in 2011 and I didn’t see this, nor do I remember hearing about it. Maybe they hadn’t started it yet. I love it – thanks for sharing.